Since early 2014 Microsoft is offering a free download of OneNote, at first OneNote 2013, now OneNote 2016. Is it really the full OneNote 2016? And why is the Microsoft website telling me I already got it? The free Version of OneNote 2016 lacks the ability to store notebooks on or load/import them from local drives and folders. The corresponding menu entries are there but selecting them only results in an error message. OneDrive or OneDrive for Business as storage location is mandatory in the free version of OneNote 2016. This can especially lead to big problems if you took the tempting offer to update your (Office version of) OneNote 2010 or 2013 to the free OneNote 2016. See this article. All functions related to other MS Office modules are missing. This includes sharing tasks or contacts with Outlook, importing embedded previews of Excel or Visio documents and even exporting OneNote pages to MS Word. This may not be a biggie as if you want to let OneNote work with Outlook, you have the full MS Office suite installed and thus also the full-featured OneNote 2016. But it is a problem if you tried to replace OneNote 2010 or 2013 with the free OneNote 2016 while keeping the older Office version. 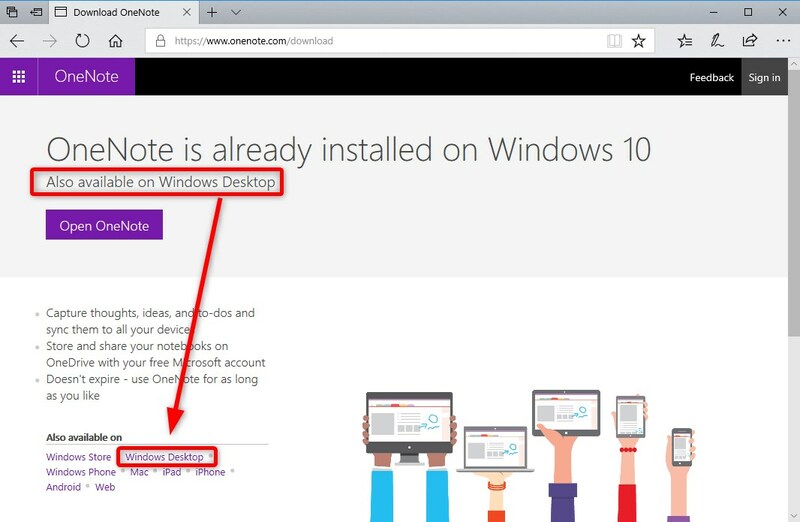 If you navigate to the download page for OneNote with a web browser (https://www.onenote.com/download) on a Windows 10 system, you are greeted with “OneNote is already installed on Windows 10” and a button to open it. This is not OneNote 2016 but the Windows 10 UWP app instead. There is an additional line of text that says “Also available on Windows desktop”. Yes, this somewhat cryptic hint (at least the UWP app is also running on a Windows desktop) is referring to OneNote 2016. But there is no link or button next to that line. In fact the link is on the page, just not very prominent. On the lower left of the page there is a list of all free OneNote clients like for iOS or Android. Just click on Windows Desktop to download a small installer program that will download and setup the free OneNote 2016 to your PC. It is unclear if Microsoft will keep the free desktop version or abandon it at any point. For now, they just hide it somewhat on the download page to promote the UWP app, the only one that gets any development resources at the moment and maybe at some point the only remaining OneNote client for Windows. Previous Cloudless: OneNote Without OneDrive?